When your childproof bottles are empty, save the childproof bottle-tops. Wash out the bottle tops, and store in your kitchen drawer. When you buy something in a bottle you wouldn't want your child to get into - but it doesn't come with its own child-proof top, just check your child-proof bottle-top stash for a bottle-top that fits! IDEA! 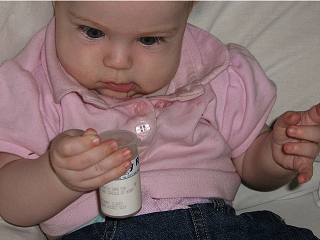 : Some pharmacies will also give you a child-proof bottle-top free, upon request. NOTE: A storage box or cupboard with a lock is a safer place to store any medicines or cleaning supplies.